Delicious, smooth Vanilla Bean Fudge made with Rodelle Vanilla Beans. Scroll down below to be entered to win your own gift basket of Rodelle Vanilla goodies! Vanilla Bean fudge has been on my mind for a very long time. With all the flavors of fudge I’ve made over the years, I’ve never done vanilla bean. Shocking, right? The Root Beer float fudge and the Strawberry Swirl fudge have the base of the vanilla fudge, but it’s not quite the same until you add the vanilla beans. Just like vanilla ice cream and vanilla bean ice cream are very different, so is today’s fudge! I know what you’re thinking. Vanilla Beans are expensive. It’s true. I use them sparingly and only in the BEST recipes. Like today. You could just do vanilla fudge. Sure. But why not take that extra step and create something special? I love those little flecks of vanilla bean! I also used plenty of sprinkles to give this fudge a holiday flair. Feel free to leave off the extra chocolate and sprinkles to keep it simple, yet classy. And, if you want to stretch your dollar, make vanilla sugar. It’s so easy. Once you’ve scraped your vanilla bean, put it in a mason jar and cover it with granulated sugar. Put a lid on the jar, shake, and let it set. I keep a jar (or two!) on my counter (or in my cabinets) and use the vanilla sugar in recipes like cupcakes, snickerdoodles, and lemon knots. It adds such a depth of flavor. Seriously. It’s perfect to add into any baked good that calls for sugar and vanilla extract together, use your vanilla sugar! I replace the sugar in my jar several times before removing the bean. Then I add another bean (after I scraped out the good stuff!). It’s a cycle that is hard to stop! Another thing I don’t go cheap on is Vanilla Extract. I have always bought Rodelle. Sure it’s more expensive, but it’s quality that counts, right? I mean, I can bake up dozens of mediocre cookies…but why not bake up DELICIOUS cookies instead by using a few quality ingredients? After all, you’re taking the time to bake! Make sure to check out my guide for how to make vanilla fudge for more fudge-making tips! 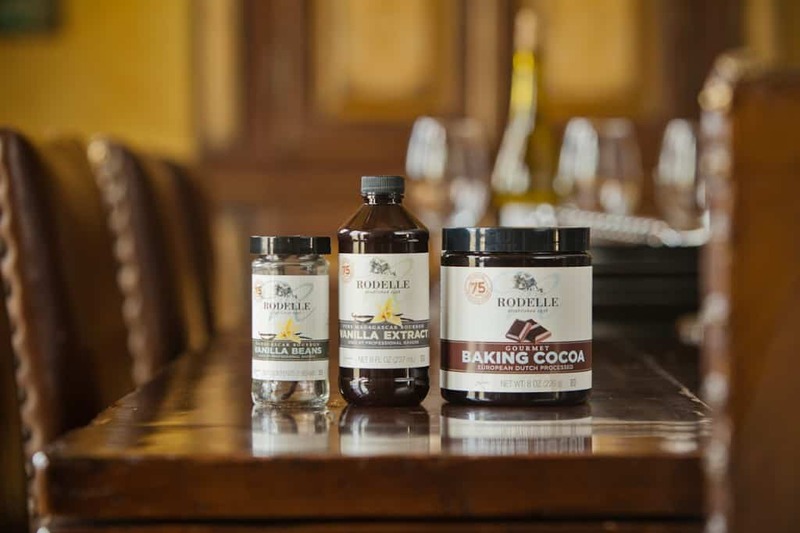 Today, Rodelle will be providing TWO lucky Shugary Sweets readers with a fun gift basket with Rodelle Cocoa, Vanilla Beans and Vanilla Extract! Be sure to enter the rafflecopter below the recipe! Delicious, smooth Vanilla Bean Fudge made with Rodelle Vanilla Beans. Line an 8inch square baking dish with parchment paper and set aside. Prepare your mixing bowl by adding the marshmallow cream, white chocolate morsels and vanilla bean. Pour these ingredients (unmelted) into the mixing bowl and set aside. In a large saucepan, melt butter with sugar, heavy cream and salt over medium high heat. Bring to boil. Stirring constantly, boil for a complete 5 minutes. Remove from heat. Pour hot mixture over ingredients in your mixing bowl. Using an electric mixer with whisk attachment, beat on medium until smooth and creamy (about one minute). Pour into prepared baking dish. Refrigerate hot fudge for two hours, until set (or overnight). 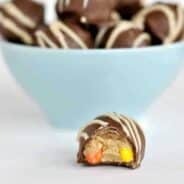 Remove parchment paper and cut into bite size pieces. 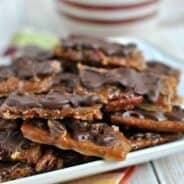 If desired, pour melted chocolate into a ziploc sandwich bag, snip off the corner and drizzle over tops of fudge pieces. Add sprinkles and enjoy. Store fudge in an airtight container in the refrigerator for up to 3 weeks. ENJOY. To scrape a vanilla bean, slice it lengthwise from end to end. Using the tip of the knife "dig" out the beans until all have been removed. Save used vanilla bean and place it in a jar of granulated sugar to make Vanilla Sugar. **I am an ambassador for Rodelle Kitchens. I have been provided free product as well as product to give away to my readers. I have received no other compensation. All opinions, of course, are 100% my own! I don’t think I’ve ever tried to make a vanilla recipe before. Maybe I’ll have to try this Vanilla Bean Fudge. I’ve been wanting to make something with Vanilla Beans. Vanilla Bean Whipped Cream…I use it on all sorts of desserts! I love a perfect chocolate cupcake with vanilla bean frosting. The fudge looks beautiful! Love those sprinkles. I make vanilla bean ice cream which is to die for. I love David Lebovitz’s vanilla bean ice cream recipe… so yummy! Vanilla bean cupcakes with chocolate frosting. Vanilla cupcakes had been the favorite, but I’ve been wanting to try vanilla fudge for quite some time – hopefully this one will move to the top! I’ve never used vanilla beans but I love to use vanilla extract in all my baked goods. I’ll have to try using actual vanilla beans and making vanilla sugar with the scraped pod. I think a really good vanilla cupcake has to be one of my favorite ways to use vanilla but i’m thinking this fudge could quickly by pass that on the list! Thanks Aimee! I think my favourite vanilla treat would have to be the really good quality vanilla ice cream. I would love to shove a few of these in my mouth right now! They look so delicious! Thanks for the recipe!!! And my favorite vanilla recipe is my vanilla bean buttercream! It’s sooo good! Such beautiful fudge! I love making a simple vanilla bean buttercream icing with fresh vanilla beans! Love this recipe!! I’ve been looking for something like this and I so agree with u on the vanilla!! But I want to ask where did u get the toping? That’s so cute perfect Christmas touch…and I know exactly who I’m making these for! Vanilla ice cream is really good. These looks so pretty and festive. Vanilla fudge is my absolute favorite, so I am positively drooling over here over the idea of vanilla bean fudge!! Love the cute sprinkles you used, too! It’s hard to choose one favorite vanilla recipe – I have too many! These look delicious! My favorite vanilla recipe is a good vanilla buttercream frosting. Yum! I love Vanilla Bean Ice Cream !! I love the look of this fudge and can’t wait to try this recipe. I’m still trying to wrap my head around what you do with the vanilla beans. I use vanilla in every thing I bake! I need to make vanilla sugar, sounds delicious!! love love love me some vanilla, my daughter laughs at me every time I use it because I always take a big whiff and say mmmm! Yes I am a dork 🙂 Thank you for this giveaway! first of all, I am a huge fan of Rodelle baking products! And I am a sucker for a very simple vanilla bean cupcake with vanilla bean buttercream frosting! Vanilla Bean Ice Cream is my favorite! Definitely vanilla cupcakes with vanilla buttercream icing. Classic & always the first to fly off our birthday party cupcake buffet’s! I have a vanilla sour cream pound cake I make. I LOVE it! The sugary coating on the cake along with the flecks of vanilla bean throughout is just divine. Thinking about it now makes me want to bake one! I’m pretty sure anything with really good vanilla in it is my favorite. 🙂 Though fudge like this…holy yummy. YUM. Will be trying these for the holidays! I want to try this fudge – what a great change up! Your sprinkles are so cute and would make any dessert perfect for Christmas! I’ve been trying to decide what fudge to make this year and you just made the decision 10x harder! 🙂 The color, the thickness, the creaminess – this looks like fantastic fudge! Vanilla Cupcakes with a Vanilla Buttercream frosting. Mmm…I would love this for the holidays! This fudge looks amazing! I love vanilla bean ice cream! Vanilla Bean Sauce and Vanilla Bean Ice Cream! YUM!!! Vanilla bean frosting! Put it on all sorts of baked goodies. I make my own homemade vanilla with rum and beans. It really adds a lot of flavor. I’ve heard of making it with vodka but I haven’t tried that yet. 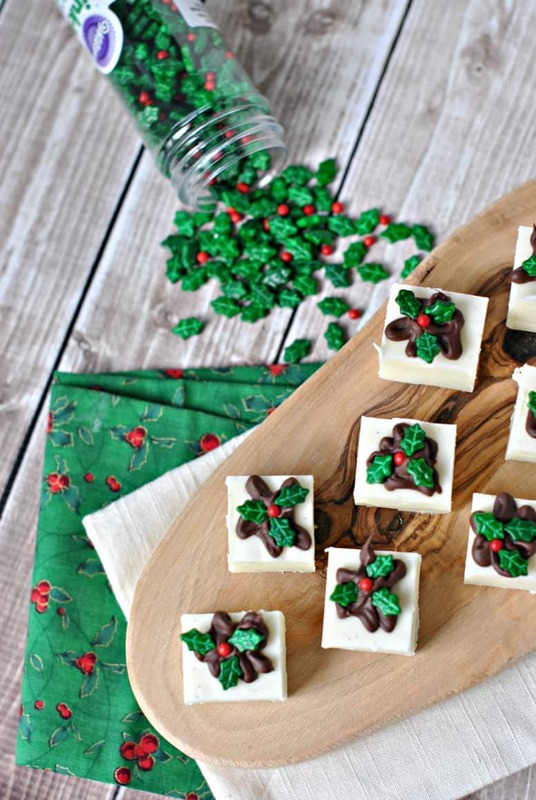 This recipe looks so interesting, I’ve never heard of vanilla bean fudge!! I love all your fudge recipes! Yummy! This sounds divine. I know what I’m trying this weekend. My kids and I love vanilla bean ice cream…yum! I think I have to add this fudge to this year’s Christmas cookie list! 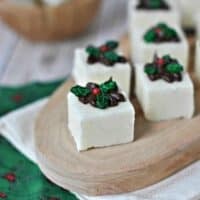 I usually only make the traditional fudge and sometimes a white chocolate fudge for the holidays. I might have to make this a special batch. I love raspberry cupcakes with vanilla buttercream frosting. So yum! Homemade vanilla bean ice cream, awesome memories from a simple food! S0 many vanilla goodies, ice cream sandwiches, vanilla nut fudge to name a few! I love the smell of really good quality vanilla, and any recipe that pairs it with apples and cinnamon! I’d love to try this recipe, even though I’m not a fudge fan it sounds delicious. Is there something that can be substituted for heavy cream? I’m allergic to have cream and half & Half. I love vanilla fudge. I can’t wait to try this one. Vanilla “any thing” will disappear very quickly in our house. Would love to win! Recipe sounds so good…I have actually never used vanilla bean in my cooking before…I’ll be sure to try it now, thank you! I love vanilla! I love vanilla bean ice cream and using vanilla beans in a sauce like creme anglais to make it extra special. Vanilla Bean Paste works great in recipes too. I LOVE VANILLA! VANILLA FUDGE! ESPECIALLY!! There is just something so magical about vanilla bean ice cream!!! Dang, girl this fudge is amazing looking! I love love LOVE the extra chocolate and sprinkles on top…so fancy shmancy looking! I have never used vanilla beans in a recipe. I am glad to know about this recipe and want so much to try it. It looks so yummy! I love good old vanilla cupcakes! Vanilla bean buttercream. Soooo good! 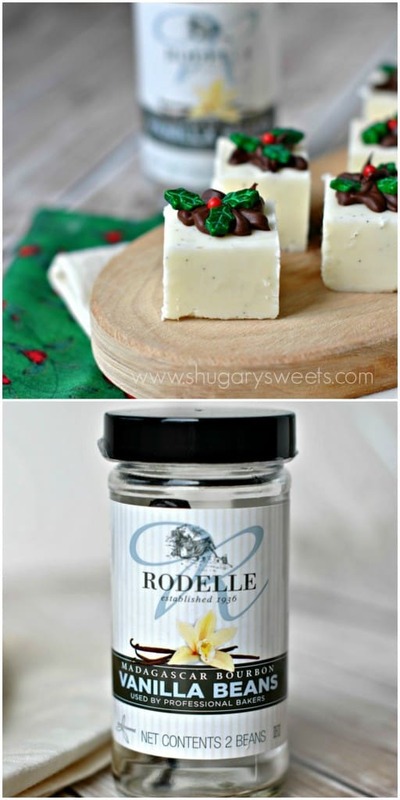 I have never had vanilla bean fudge but I LOVE the idea of it! Yours looks gorgeous! OH I love vanilla and have a ton of beans in the fridge. I can’t wait to try this! Vanilla bean ice cream! Love it!! Why do I see everyone using “kosher salt”? So gorgeous! I love the decoration on top! Anything cupcake or cake vanilla!! Would love to try making some real homemade Vanilla Sugar… Yummy!!! what does scraping a vanilla bean even mean??? Mmmm…love vanilla anything! These look delicious! The vanilla sweet potatoes I made for Thanksgiving were amazing. Aimee, this fudge is so lovely! I have never used real vanilla bean before, but I would have to try it on this recipe of yours because it is just so beautiful! I have never seen those cute holly sprinkles before. Will have to keep my eye out for them! I’m going to make different kinds of fudge for co-workers this Christmas. I would love to have these ingredients for it. Great idea for the vanilla sugar…..thanks! And this fudge looks so amazing! I will be making some this weekend! Thanks a bunch! I have been wanting to try cooking with vanilla bean, this seems like a great recipe to start! My favorite vanilla recipes would have to be Vanilla bean rice pudding and Vanilla pound cake with vanilla glae. So simple but so delicious. Vanilla bean icing – so deliciously vanilla! I don’t really have a favorite, but I’d LIKE to have one;) Thanks! Vanilla sugar is a great idea. Can’t wait to make some. Vanilla sugar in my Christmas sugar cookies! Homemade Vanilla bean ice cream…but that may change when I make this fudge. Thanks for all the great recipes. Have a great Holiday. 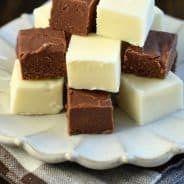 I haven’t ever tried to make my own fudge – you have inspired me! I love my Vanilla sugar and vanilla cake . Vanilla sugar for my cookies, oh, and homemade vanilla extract! Nice, moist vanilla bean poundcake! I have never used vanilla bean but always have used vanilla extract. I love to put extra vanilla in my chocolate chip cookies. Vanilla bean ice cream is my favorite, but your recipe looks amazing. I definitely want to try this and your vanilla bean snickerdoodles recipe. Vanilla bean ice cream, but this fudge looks amazing. I definitely would like to try this and your vanilla bean snickerdoodles. I am obsessed with all things vanilla. This fudge sounds awesome. Would love to win this in time for my Christmas baking with the grandchildren. I’ve never tried obe of your vanilla recipes but I have made a few of your fudge recipes and they have beeb super yummy! I’ve gotten lots of great comments after people have eaten it. These look amazing, I can’t wait to try this recipe out. My favorite vanilla recipe is vanilla cake from scratch. I always add extra vanilla. This fudge looks great. My favorite vanilla is vanilla bean ice cream, so simple and elegant! Ahhh, GORGEOUS fudge. My sister got me these same holly sprinkles when she was away on a trip! I love how you arraigned them – so cute and just perfect. I LOVE vanilla beans. At my grocery store they go for the crazy price of $17.99 for 2 BEANS. But I’ve recently found them at another store (about an hour away) that sells them for 99 cents a bean. Craziness! Mmmm rice pudding! My ultimate comfort food! I love ANYTHING vanilla! But this time of year one of my favorites is my mom’s vanilla cream oatmeal. I like using Vanilla beans in my Original Cheesecakes! Adds a little extra yumminess to the cheesecake plus it looks so pretty!!! I love a decadently rich, Vanilla Bean homemade ice cream. These look amazing! Trying them soon! Yum! I love vanilla…wish the beans weren’t so expensive. I have a real penchant for anything vanilla! I enjoy vanilla in my coffee – I add half of a vanilla bean (sliced open) to my coffee grounds and a pinch of cinnamon. Delicious and smells fabulous! I love vanilla bean anything! Can’t wait to try this recipe. I am so going to have to try this! Sounds incredible! Vanilla kicks everything up a notch. I especially love a couple drops in my coffee. I love all things vanilla…especially with vanilla bean in it!! I make vanilla bean whipped cream to top all kinds of things…I think that may be my favorite. My favorite is Vanilla cheesecake! Yum!! I love homemade vanilla ice cream! I guess vanilla bean ice cream with vanilla bean shortbread cookies but it may end up being this vanilla bean fudge as soon as i get some marshmallow cream so i can make it. Ohhh these look delicious! I’m definitely going to keep an eye out for the Rodelle vanilla, it sounds amazing! 🙂 Thanks for the wonderful recipe and giveaway! I love those flecks of vanilla! My perfect kind of dessert! I make an awesome vanilla bean buttercream frosting 🙂 It is a great contrast to a dark chocolate cupcake, and I love using it on chai spice cupcakes as well. I think your vanilla bean fudge would be a great treat for my husband. Vanilla Bean Ice Cream is #1 in my house. I can’t wait to try this fudge! My favourite vanilla recipe though is butter cream icing for almost any cake with extra vanilla. Vanilla ice cream – has to use lots of vanilla! I Love anything Vanilla!! With basically a blank slate you can Create Anything!!!!! My favorite vanilla recipe would be Pioneer Woman’s vanilla bean scones. They are heaven on a plate! 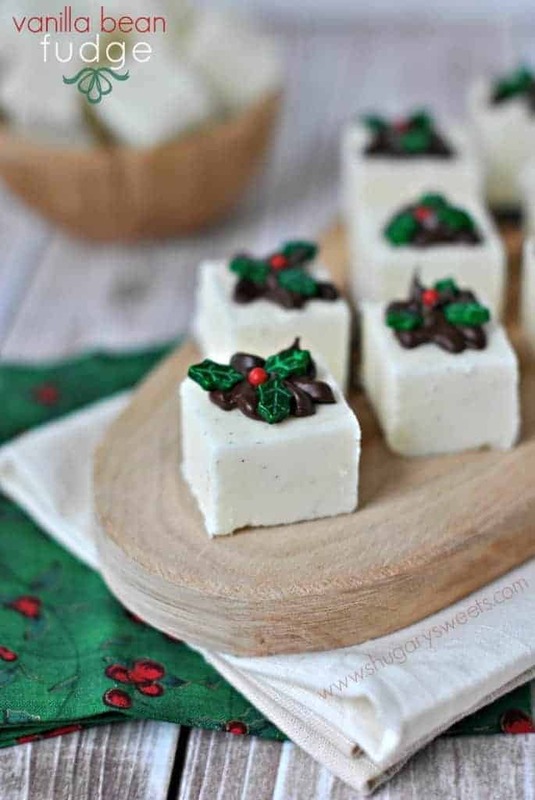 This Vanilla bean fudge sounds sooo good, I want some now! Oooh this looks delicious! I love vanilla in everything, from vanilla buttercream frosting to homemade vanilla ice cream! Vanilla coffee creamer! I know it’s probably a weird recipe, perse, but I love it! I”ve never used vanilla bean before…this vanilla bean fudge looks awesome! Vanilla bean ice cream (nothing beats homemade ice cream!) with a vanilla bean caramel sauce! I love vanilla. 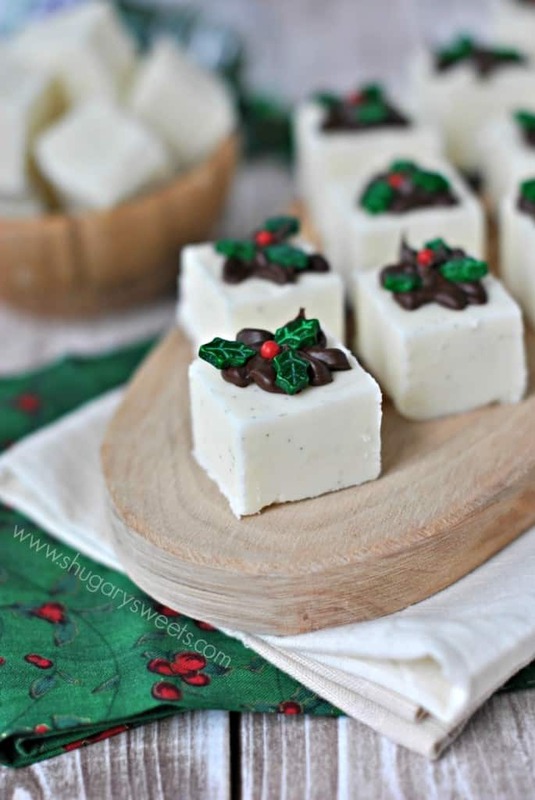 And I just added this fudge to my holiday baking list! Vanilla CuppyCakes with Vanilla Bean Frosting! That’s what’s in the oven right now, so I had to check out recipes while they’re baking 🙂 This fudge looks amazing, tomorrow nite maybe? Definitely Yes! Vanilla Bean Buttercream Frosting for sure! I would love LOVE some whole vanilla bean. Not easy to find around here. Overall, this was delicious. I loved the specks of vanilla bean throughout! A few people thought it was too over-the-top sweet, so I may try to turn the dial back on the sugar a little bit. I made these last year…they are so delicious and they look so pretty and festive! The vanilla bean is expensive and SO WORTH it… The flavor makes the cost so worthwhile. Just made a batch of this fudge. It turned out awesome. I used a Rodelle Vanilla Bean I received from a blogging conference. My daughter saw this on pinterest and she begged for me to make it since she doesn’t like traditional chocolate fudge flavors. So happy to hear your loved it 🙂 Merry Christmas!! I tried this recipe and it was so awesome! I used vanilla bean paste instead of from the bean and I didn’t boil it long enough. But! I’m doing another batch today and will cook it longer so it will set up better!! Thank You for this recipe!! Can you use evaporated milk instead of heavy cream?